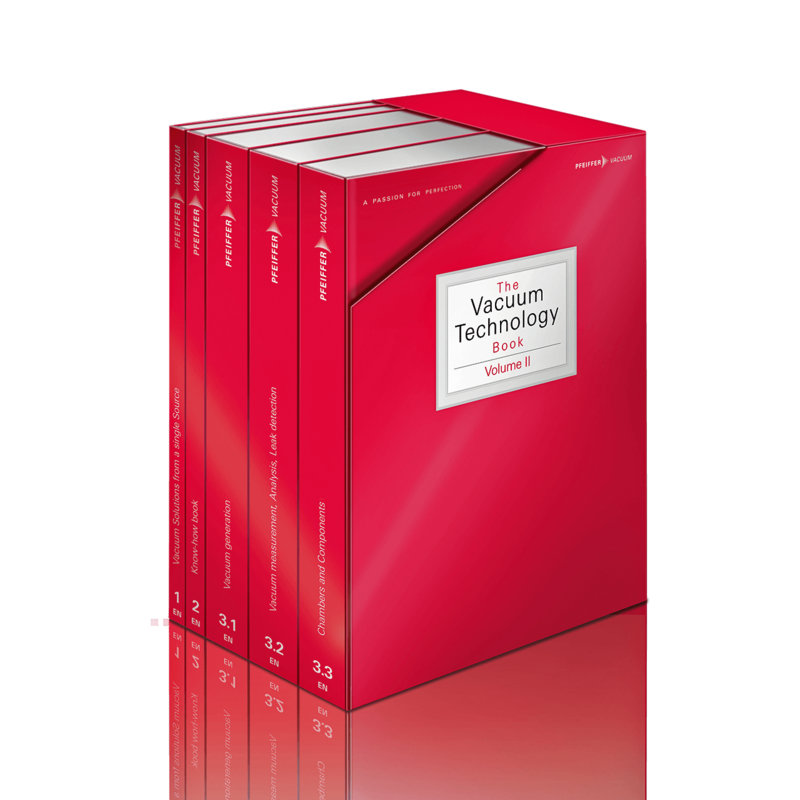 In vacuum technology, the requirements placed on any material are very diverse. Depending on the application, ambient conditions and the vacuum to be achieved, it must be tested which requirements the materials must meet. in addition to the structural integrity, it must be ensured that the deformation of the functional surfaces does not impact the functionality. Example: The atmospheric air pressure on evacuated chamber components is approximately 10 N/cm2. With an area of 1 m2, this results in a force of 100,000 N.
Each material is basically gas permeable. The overall process of gas permeability is called permeation. It depends on the material, the type of gas and the ambient conditions – especially the temperature. With the use of elastomer seals, their permeation must be considered. Example: For an FKM (fluoroelastomer) seal of DN 500 ISO-K, the permeation rate for atmospheric air with 60 % humidity is about 4 · 10-7 Pa · m3/s. Therefore typical vacuum systems with FKM seals rarely achieve a working pressure of more than 1 · 10-8 hPa. Intrinsic vapor pressure that is too high limits the final vacuum pressure. In addition to the vacuum compatibility of oils and grease, the intrinsic vapor pressure of metals or their partial pressure in alloys must be considered in alloys. Example: For brass, the partial pressure of the zinc is limited to a maximum permissible temperature in a high vacuum at about 100°C. Clean surfaces are a prerequisite. However, any surface that was exposed to the ambient air, is coated with an adsorbed layer. Chemically or physically adsorbed molecules on the surface or in the volume of the material represent a source of gas once they desorb (when they detach from surface). To achieve a low final pressure, materials with low desorption rates must be used. Example: A monolayer of adsorbed gas roughly equals a gas quantity of 4 · 10-2 Pa · m3/m2. Considering a pipe, closed at both ends, with a diameter of 50 cm and a length of 100 cm (surface area of about 2 m2, volume approx. 200 l), the release of the monolayer results in a pressure rise of about 0.4 Pa or 4 · 10-3 hPa. This does not take into account the fact that the surface is always larger than the geometric area. Example: The different thermal expansion limits the maximum permissible temperature for the combination of aluminum seal and stainless steel flanges to about 150°C. Often after too high temperatures, a deterioration in the sealing effect occurs during cooling. Example: A lot of coating processes require chemically active process gases. It is therefore necessary to consider whether the fluids used affect components or seals. In particular, thin-walled components such as metal bellows are vulnerable to corrosion. If necessary, their service life should be determined in tests. Special applications may also place further demands on the materials. As a general rule: the lower the desired working pressure, the greater the demands placed on the material and the smaller the selection of possible materials. Therefore, especially in UHV (ultra-high vacuum) technology, the choice of materials is of great importance.